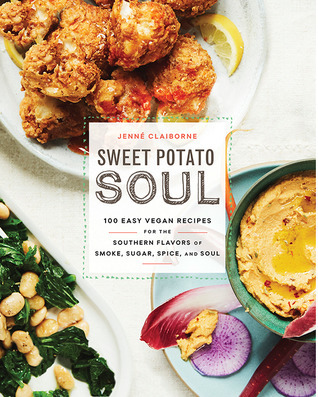 I am a long time vegetarian, a southern girl, and a great fan of soul food ... so Sweet Potato Soul immediately appealed to me! The first thing to know: this is a beautiful cookbook, with great food photos. The recipes are laid out one to a page, with ingredients and 1-2-3 directions, just the way I like. I really loved the introduction on southern food. Jenne Claiborne even details pantry items for southern cooking, southern fruits and vegetables, spices, baking staples, sweeteners. There is a short section on varieties of sweet potatoes! 1. Avoid all animal products. 3. Don't count calories or protein. Are the recipes vegetarian (or can I tweak them to be veggie friendly)? Yes, this is a vegan cookbook! Are the ingredients readily accessible at any grocery store? Yes, the ingredients in this book are delightfully accessible foods that should be available anywhere. Are the recipes straightforward and easy to make on a busy work night (i.e. 30 - 60 minutes tops)? Most of the recipes are pretty straightforward. Some do include multiple steps. For instance, Low Country Grits (which looks amazing!) does require the cook to also make either Creole Red Bean Sausage or Smoky White Bean Sausage ... so not a great work night recipe. To give you an idea of the delicious variety of recipes in this cookbook, here are a few that particularly appealed to me: Sweet Potato Skillet Home Fries, Sweet Potato Pie Smoothie, Bourbon BBQ Tempeh Sandwiches, Georgia Watermelon and Peach Salad, Coconut Corn Chowder, Jalapeno Hush Puppies, Spicy Fried Cauliflower "Chicken," Happy Hearts "Crab" Cakes, New Orleans Style Red Beans and Rice, Cajun Blackened Tofu Sandwich, Smoky Black Eyed Pea Cakes, Georgia Pecan Pie, Ginger Kissed Peach Cobbler ... and this is just a small sampler! I rate this vegan cookbook five stars and highly recommend it to anyone who loves southern cooking, vegan cooking, or vegetarian or "Meatless Monday" cooks who want to add more plant based southern food to their diet! I received a copy of this book from Blogging for Books.